Does he have different sound effects in Super Mario Maker? Especially the jump sound effect. I haven't posted here in forever, but here's a what-could-have-been for Modern Mario, using sprites from Super Mario Maker. The mushroom sprite is the Big Mushroom (from the 30th Anniversary Amiibo). Also, not all the sprites are just color changes, there are small tweaks and two new poses. The skidding sprite is completely different as well. 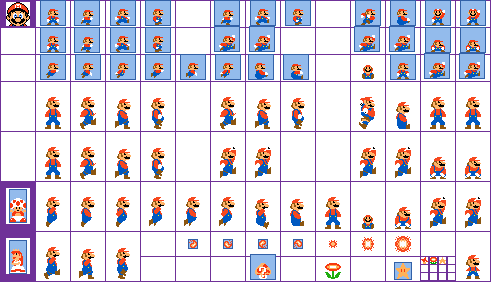 This version has the sprite boundaries from the sprite rips, though some are just palette changes. Anything without a boundary is custom. This should help people port the other mystery costumes over. Also, this is a slightly older version of the sheet before I'd edited the big Mario sprites, and I had the Mystery Mushroom as the mushroom sprite. Hernan23Pro and Mitewing like this. Great work! I love how the new sprites give it it's own identity rather than a simple recolor. i have a question how to you change the character sprites in sonic boll? That comment will be removed due to it being off-topic. The creators of Sonic Boll are on New Game+, go there for support on the now-named Boll Engine. EDIT: I did not intend to be mean, I was just telling you that New Game+ is the place to ask about Sonic Boll or Boll Engine. You should probably use the mini sprites from Sonic CD and not the sprites from StH MS/GG. So I'm working on a NSMB Mario REDUX, hoping it will be at least good. 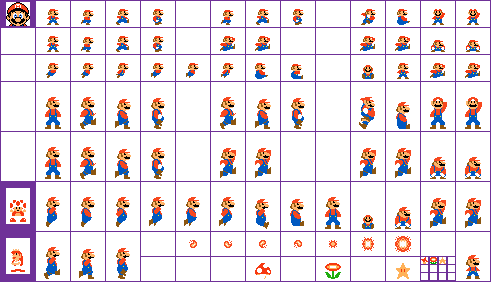 Here's a suggestion: Use the Sonic sprites from Super Mario Maker. i used SMM sonic sprites for mini-sonic climbing animation,i will see if i got some time this week or some day. These look like great skins! sorry about blurriness, I'm too lazy to play sonic 2 to snap it myself. Pretty good. Who is he? Thanks! It's Sint Nicolaas from the game of the same name. The portrait is the Sint '99 sprite while the rest of the sprites are ripped from the Android port. My idea is that Sint Nicolaas picks up presents and they would follow him like in the original games. Mushroom gives him a purple present and Fire Flower gives him a red present. i looked at his sig, and can we actually put skins in game now, or is it just an edit..?